We were recently invited to the Bahama Breeze restaurant to celebrate a friend’s 50th birthday. Our friends suggested a salad of mixed greens, grilled chicken, tropical fruit and tropical dressing, goat cheese and candied almonds. And boy was it was ever yummy! As I surveyed the ingredients, I began thinking of ways that I could replicate this delicious salad for my family. Mix all ingredients together. Refrigerate. Marinate chicken breasts in orange and pineapple juices, Creole seasoning, cilantro and oil. Place in refrigerator for thirty minutes. When ready, grill chicken for 5 to 6 minutes on each side or until juices run clear. Cooking time will depend on the thickness of your chicken breasts. Let rest a minute or so before cutting into. This keeps your chicken breast moist. If you cut too early after grilling, the juices will run out – Oh no, we don’t want that! 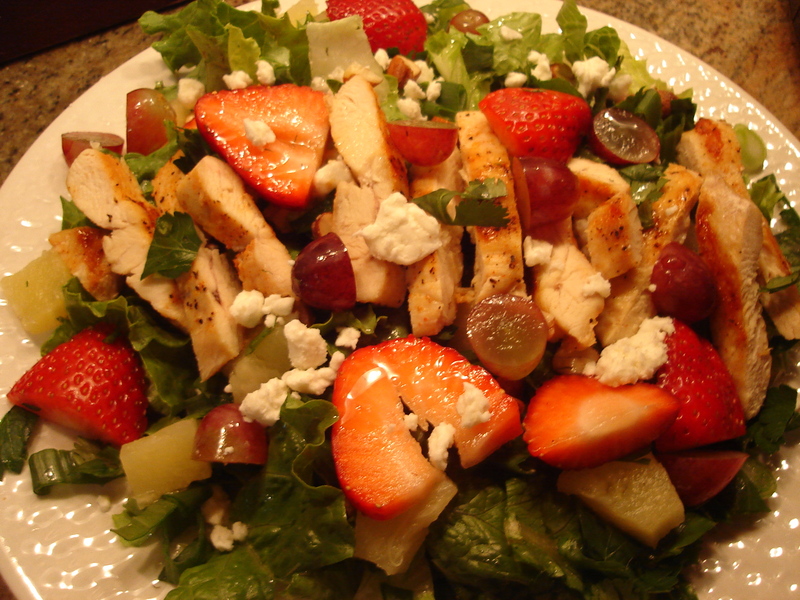 Arrange greens, freshly chopped cilantro, chicken, fruit, goat cheese and spiced nuts on a plate. Drizzle your Citrus Vinaigrette over top and enjoy!